NORTH BAY, Ont. 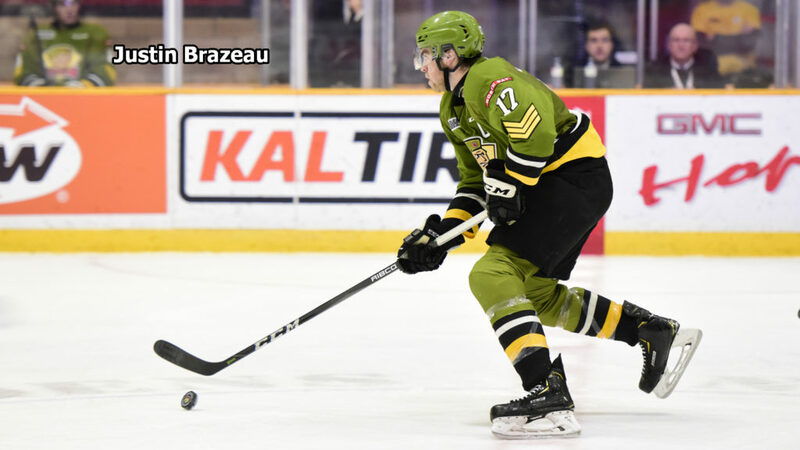 — Justin Brazeau authored an offensive season like none other in North Bay Battalion history in 2018-19. Brazeau scored a franchise-record 61 goals and added 52 assists for 113 points in 68 games, finishing second in the Ontario Hockey League’s scoring race to Jason Robertson of the Niagara IceDogs. Mike Amadio had held the record with 50 goals in 2015-16. The offensive showing saw Brazeau win the Jim Mahon Memorial Trophy as the OHL’s highest-scoring right winger. Brazeau is the second Battalion player to receive the honour, after John Hughes, who had 28 goals and 63 assists for 91 points in 2007-08 for Brampton. Recent winners include Alex DeBrincat of the Erie Otters and Mitchell Marner of the London Knights. The trophy, first awarded in 1971-72, was donated by the Peterborough Petes in honour of a Petes player who died in an accident in the summer of 1971. Brazeau became one of three North Bay representatives in the OHL to achieve the 60-goal level, joining two North Bay Centennials, in Nick Kypreos, with 62 goals in 1985-86, and Vitali Yachmenev, with 61 in 1993-94. Brazeau is the second Battalion player with 100 points in a season, after Wojtek Wolski, who produced 47 goals and 81 assists for 128 points in 2005-06. It’s the first time North Bay has had a 100-point player since the Cents’ Trevor Gallant amassed 47 goals and 58 assists for 105 points in 1995-96. Brazeau had 33 multi-point performances, including five three-goal games and a league-high seven-point outburst Oct. 21 against the visiting Kingston Frontenacs. A 13th-round pick in the 2014 OHL Priority Selection, the New Liskeard, Ont., native finished his 268-game career with 128 goals, 110 assists and 238 points, third in Battalion annals behind Wolski and Cody Hodgson. Brazeau’s goals are second to Wolski’s 130, and his assists total is tied with Brett McKenzie’s as seventh-best in franchise history. Brazeau’s exploits led the Battalion, with a won-lost-extended record of 30-33-5 for 65 points, to a fourth-place finish in the Central Division, seventh place in the Eastern Conference and a first-round playoff meeting with Niagara. Matthew Struthers ranked second in Battalion scoring with 31 goals and 50 assists for 81 points in 61 games, while Brad Chenier produced 30 goals and 35 assists for 65 points in 61 games. Nick King led defencemen in scoring with eight goals and 32 assists for 40 points in 67 games, and Brandon Coe contributed 17 goals and 20 assists for 37 points in 65 games. Luke Burghardt, who returned to action in December from a spinal issue, scored nine goals and earned 21 assists for 30 points in 39 games, while Mason Primeau had 10 goals and 16 assists for 26 points in 49 games after a Nov. 15 trade from the Guelph Storm. Defenceman Simon Rose netted three goals and added 19 assists for 22 points in 57 games, and Harrison Caines registered nine goals and 12 assists for 21 points in 56 games. Struthers and Primeau each had a three-goal game to join Brazeau with that distinction. Brazeau led the Troops with 10 game-winning goals, while Struthers had five, Chenier four and Adam McMaster, who was traded to the Owen Sound Attack on Dec. 28, three. North Bay was credited with 230 goals, tied with Erie for 13th in the OHL. Niagara produced a league-high 326. The Battalion was charged with 281 goals against, 13th-best in the league. The Ottawa 67’s were top-ranked, with 183. Brazeau paced the Battalion with 14 power-play goals, followed by Struthers with 12. Chenier had eight and King five. North Bay scored 56 power-play goals in 232 opportunities for an effectiveness rate of 24.1 percent, sixth in the OHL. The Kitchener Rangers boasted the top-rated power play at 29.0 percent. The Battalion scored five shorthanded goals, led by Chenier with two. Primeau, Mitchell Russell, who was acquired for McMaster, and Luke Moncada had the others. The Troops surrendered 64 power-play goals in 286 times shorthanded for a kill rate of 77.6 percent, 11th in the OHL. London had the best penalty killers at 85.8 percent. Daniel Walker had a league-high 129 penalty minutes, while Theo Calvas was second on the Battalion with 75. Chenier was assessed 74 minutes and Primeau 45. North Bay was sixth in the OHL in penalties at 12.0 minutes per game. The Sudbury Wolves led the penalty parade at 13.7 minutes a game. Brazeau topped the Troops in plus-minus figures at plus-14, while Struthers was plus-9. Brazeau and Moncada were the only players to see action in all 68 games, although Primeau played 69 between Guelph and North Bay. In 51 appearances, goaltender Christian Propp posted a 24-24-2 record with a 3.98 goals-against average, an .893 save percentage and two shutouts. Christian Purboo was 6-9-3 in 23 appearances with a 3.90 GAA and an .897 save percentage. Joe Vrbetic played in one game, with a 3.67 GAA and an .857 save percentage. North Bay went 17-13-4 at home and 13-20-1 on the road. The Battalion, 21-24-1 within the conference, was 13-12-1 within the division and 8-12-0 against the East Division. In going 9-9-4 against the Western Conference, the Troops were 4-4-2 against Midwest Division foes and 5-5-2 against the West Division.